Whole cherries and a graham cracker crust make this creamy cheesecake a decadent combo that you'd be hard pressed to match. Handmade from scratch and generously portioned, this winning dessert is destined to be the star of the party wherever you send it. 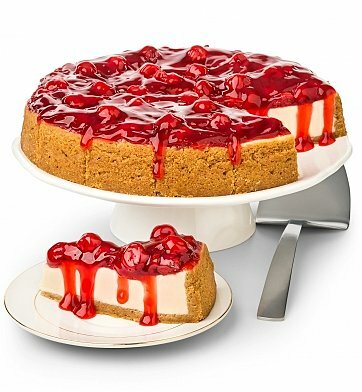 Classic New York Style Cherry Cheesecake. Cherry Cheesecake is a hand delivered gift. These gifts are delivered by one of our local design centers located throughout the United States and Canada. Same day delivery is available for most gifts when ordered before the cutoff time. The cutoff time for Cherry Cheesecake is in the recipient's time zone.